For other people with the same name, see Fred Jackson (disambiguation). Frederick George "Fred" Jackson (born February 20, 1981) is an American football running back who is currently a free agent. He played college football at Coe College. After going undrafted in 2003 and playing in NFL Europe, Jackson spent nine seasons with the Buffalo Bills, becoming their third all-time leading rusher. As of the 2015 season, he is the oldest running back in the NFL. Jackson attended Lamar High School in Arlington, Texas, where he played football and ran track. Although he was a member of the powerful Lamar Vikings teams of the late 1990s, he never started a game in his two years on the varsity team because he was considered too small (5 ft 8 in, 160 pounds) and too slow. He began his senior year as a third-string running back, and only after a knee injury to starter Justin Faust (headed to Stanford), was he elevated to second-string behind Tommicus Walker (headed to TCU). Also a standout sprinter, Jackson was a state-qualifier in the 100 meters and recorded a time of 21.78 seconds as a member of the Lamar 4×100 m relay squad, breaking the previous record. During his senior year, 14 of his teammates signed letters of intent to play college football, but he did not receive any offers. Instead, Wayne Phillips, his Nichols Junior High School football coach, arranged for him and his brother to enroll into Coe College, a Division III school that does not offer athletic scholarships. At Coe College, Jackson was named to four All-American teams in 2002, rushing for 2,702 yards and 29 touchdowns. He was a two-time Iowa Intercollegiate Athletic Conference MVP for the Kohawks. He graduated in 2003 with a degree in sociology. After trying out for the Chicago Bears, Denver Broncos and Green Bay Packers, and being seen as too small a player for the National Football League (NFL) at 6'1" but only 195 lbs, he went on to play indoor football for the Sioux City Bandits where he earned $200 a week, and an additional $50 for a win. Jackson played two seasons for the Bandits in the National Indoor Football League (2004) and United Indoor Football (2005). He was named the 2005 UIF co-MVP in 2005; in 18 games he ran for 1,770 yards and scored 53 touchdowns (40 rushing, 11 pass receiving and 2 on kick returns). During this time he also worked as a youth counselor at Four Oaks to make ends meet. His jersey number was retired by the Bandits in 2008. While with the Bandits in 2004, Jackson's childhood home in Arlington, Texas, was torn down to make way for Cowboys Stadium, which replaced Texas Stadium as the home of the Dallas Cowboys in 2009. Jackson played in his former neighborhood on November 13, 2011, when the Bills faced the Cowboys. Jackson played in NFL Europa for the Rhein Fire in 2006, leading the team with 731 rushing yards. Jackson was invited to training camp with the Buffalo Bills in 2006 by Bills general manager Marv Levy, a Coe College alumnus himself. He made his first career start against the Washington Redskins in 2007, rushing for 182 yards while catching four passes for 69 yards in a Bills victory. He became the first Division III running back to start an NFL game since December 24, 2000, when former Ferrum College running back Chris Warren started for the Philadelphia Eagles against the Cincinnati Bengals. In a 2007 victory over the Miami Dolphins, Jackson rushed for 115 yards with a long of 27 yards to top the 100-yard rushing mark for the first time in his NFL career. Teammate Marshawn Lynch rushed for 107 yards, marking the first time the Buffalo Bills had two players rush for 100-plus yards in the same game since 1996 when Thurman Thomas and Darick Holmes accomplished the feat. Before the 2009 season, Jackson signed a four-year contract extension to stay with the Bills. In 2010, after winning the starting job from Lynch in Week 12, Jackson eclipsed the 1,000-yard rushing mark for the first time in his career with 1,062 yards and 2 touchdowns. He also set a career high in catches with 46 for 371 yards and 2 more scores and also completed a 27-yard touchdown pass. Jackson also had 1,014 kickoff return yards making him the first player in NFL history to compile 1,000 rushing and 1,000 kickoff return yards. The 2,516 combined yards are the fifth highest all-purpose yards total in NFL history. In Week 17 of the 2009 season, versus the Indianapolis Colts, Jackson had a career day with 212 rushing yards and a receiving touchdown. In 2011, Jackson was having his best season to date, as the team's undisputed starting running back. Jackson had six 100-yard rushing games in the first ten weeks. During a Week Eleven loss to Miami, however, Jackson suffered a fractured fibula. Jackson was placed on injured reserve later in the week, and missed the remainder of the season. At the time of his injury, Jackson's 934 yards were third in the NFL. The Bills had already been on a three-game losing streak when Jackson was injured, but lost all games but one for the rest of the 2011 season without Jackson. For his strong performance he was named to the USA Today All Joe Team as he was no longer Pro Bowl eligible. On May 5, 2012, Jackson signed a two-year contract extension, keeping him with the Bills until 2015. Jackson had arguably the best season of his career in 2013. Despite playing as the backup to C. J. Spiller most weeks, Jackson accumulated 1,283 yards from scrimmage and scored 10 total touchdowns. On October 19, 2014 Jackson suffered a groin injury against the Minnesota Vikings. He returned on November 9 against the Kansas City Chiefs. On August 31, 2015, two days after he ran for 43 yards and a touchdown in a preseason win against the Pittsburgh Steelers, the Bills released Jackson as part of roster cuts. He finished third on the Bills' all-time rushing list. On September 7, 2015, Jackson signed a one-year deal with the Seattle Seahawks, reuniting him with former Buffalo teammate Marshawn Lynch. The Seahawks clinched a Wild Card berth in the playoffs, marking Jackson's first time participating in the postseason. On January 10, the Seahawks beat the Vikings 10-9 in the Wild Card round of the playoffs, giving Jackson his first career playoff win. During the 2009 season, Jackson became the first player in NFL history to compile 1,000 rushing and 1,000 kickoff return yards. 2010 winner of the Buffalo Bills/NFL Walter Payton "Man of the Year" award. During the 2010 season, Jackson was named to the USA Today All-Joe Team for his quality play. Jackson is married to Danielle Jackson, with whom he has four children. The couple have been married since 2006. On October 20, 2015, it was initially reported that a drag race just outside the Seahawks' training facility between Fred Jackson and fellow teammate Marshawn Lynch ended with Jackson crashing his Corvette, first into a planter box and then a stop sign. However police later denied the report and said he was simply driving too fast. Jackson had his own television program airing on WBBZ-TV. The Fred Jackson Show aired Mondays during football season. It debuted on September 10, 2012, and ran for Jackson's last three years in Buffalo. ↑ "Fred Jackson NFL Football Statistics". Pro-Football-Reference.com. 1981-02-20. Retrieved 2012-12-25. ↑ Fairburn, Matthew. "Fred Jackson, the NFL's oldest running back, wants to play 3-4 more seasons". Syracuse.com. Advance Digital. Retrieved September 7, 2014. ↑ "Fred Jackson". trackingfootball.com. Retrieved November 15, 2015. ↑ MJD. "Jerry Jones built Cowboys Stadium on Fred Jackson's old house - Shutdown Corner - NFL Blog - Yahoo! Sports". Sports.yahoo.com. Retrieved 2012-12-25. ↑ "Fantasy Football Breaking News". Rotoworld.com. Retrieved 2012-12-25. ↑ New record was set in 2011, Pro-Football-Reference.com: For single seasons, from 1920 to 2011, sorted by descending All-Purpose Yds. ↑ Galliford, Brian (2010-01-05). "Putting Fred Jackson's 2009 season in perspective". Buffalo Rumblings. Retrieved 2012-12-25. ↑ "Player Game Finder Query Results". Pro-Football-Reference.com. Retrieved November 15, 2015. ↑ Weisman, Larry (2009-01-22). "Annual All-Joe team: Honoring those who won little acclaim". USA Today. 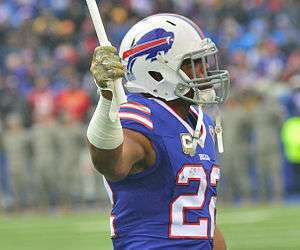 ↑ "Fred Jackson of Buffalo Bills rewarded with contract extension - ESPN". Espn.go.com. 2012-05-07. Retrieved 2012-12-25. ↑ Rodak, Mike (October 19, 2014). "Fred Jackson, C.J. Spiller injured". ESPN.com. Retrieved October 19, 2014. ↑ "Buffalo Bills release longtime running back Fred Jackson". SB Nation. Retrieved 31 August 2015. ↑ "Buffalo Bills Career Rushing Leaders - Pro-Football-Reference.com". Pro-Football-Reference.com. Retrieved November 15, 2015. ↑ Rosenthal, Gregg (September 4, 2015). "Fred Jackson agrees to contract with Seattle Seahawks". NFL.com. Retrieved September 4, 2015. 1 2 3 "Fred Jackson's Wife Danielle Jackson". ↑ Davis, Nate (2010-01-28). "Joe Flacco an overachieving headliner on '09 All-Joe Team". Usatoday.Com. Retrieved 2012-12-25. ↑ "Fred Jackson". NFL.com. Retrieved November 15, 2015. ↑ "Fred Jackson wrecks car in reported drag race with Marshawn Lynch". NBC Sports. 20 October 2015. Retrieved 20 October 2015. ↑ "Renton Police: No further investigation into accident involving Seattle Seahawks' Fred Jackson". Seattle Times. 21 October 2015. Retrieved 12 February 2016. 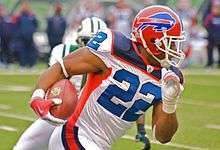 ↑ ""The Fred Jackson Show" To Return For 3rd Season". WBBZ. 8 September 2014. Retrieved 1 October 2013.